Machado, Helena and Granja, Rafaela 2018. Ethics in Transnational Forensic DNA Data Exchange in the EU: Constructing Boundaries and Managing Controversies. Science as Culture, Vol. 27, Issue. 2, p. 242. Mertz, Marcel and Schildmann, Jan 2018. Beyond integrating social sciences: Reflecting on the place of life sciences in empirical bioethics methodologies. Medicine, Health Care and Philosophy, Vol. 21, Issue. 2, p. 207. Greason, Michelle 2018. Connecting Findings to Meaningful Change. International Journal of Qualitative Methods, Vol. 17, Issue. 1, p. 160940691880327. Silkoff, David Guillemin, Marilys Chenhall, Richard and McDougall, Rosalind 2018. What ethical resources are available to Alcohol and Other Drug practitioners? A systematic review. Clinical Ethics, Vol. 13, Issue. 1, p. 34. Newham, Roger and Papanikitas, Andrew 2017. Handbook of Primary Care Ethics. p. 251. Forsberg, Ellen-Marie Shelley-Egan, Clare Thorstensen, Erik Landeweerd, Laurens and Hofmann, Bjorn 2017. Evaluating Ethical Frameworks for the Assessment of Human Cognitive Enhancement Applications. p. 7. Heeney, Catherine 2017. An “Ethical Moment” in Data Sharing. Science, Technology, & Human Values, Vol. 42, Issue. 1, p. 3. Nair, Tara Savulescu, Julian Everett, Jim Tonkens, Ryan and Wilkinson, Dominic 2017. Settling for second best: when should doctors agree to parental demands for suboptimal medical treatment?. Journal of Medical Ethics, Vol. 43, Issue. 12, p. 831. 1. Harris, J. The scope and importance of bioethics. In: Harris, J, ed. Bioethics. Oxford: Oxford University Press; 2001:1–24. 2. Garrard, E, Wilkinson, S. Mind the gap: The use of empirical evidence in bioethics. In: Hayry, M, Takala, T, Herissone-Kelly, P, eds. Bioethics and Social Reality. Amsterdam: Rodopi; 2005:77–92. 3. Ashcroft, RE.Futures for bioethics? Bioethics 2010;24:ii. 4. Hedgecoe, AM.Critical bioethics: Beyond the social science critique of applied ethics. Bioethics 2004;18:120–43. 5. Hurst, SA.What “empirical turn in bioethics”? Bioethics 2010;24:439–44. 6. Hedgecoe, AM. Medical sociology and the redundancy of empirical ethics. In: Ashcroft, RE, Dawson, A, Draper, H, McMillan, J, eds. Principles of Healthcare Ethics. 2nd ed. Chichester, West Sussex: Wiley; 2007:167–76. 7. De Vries, R, Stanczyk, A, Wall, IF, Uhlmann, RA, Damschroder, L, Kim, SYH.Assessing the quality of democratic deliberation: A case study of public deliberation on the ethics of surrogate consent for research. Social Science and Medicine 2010;70:1896–903. 8. Kim, SYH, Wall, IF, Stanczyk, A, De Vries, R.Assessing the public’s views in research ethics controversies: Deliberative democracy and bioethics as natural allies. Journal of Empirical Research on Human Research Ethics 2009;4:3–16. 9. Lenaghan, J, New, B, Mitchell, E.Setting priorities: Is there a role for citizens’ juries? British Medical Journal 1996;312:1591–3. 10. Wainwright, P, Gallagher, A, Tompsett, H, Atkins, C.The use of vignettes within a Delphi exercise: A useful approach in empirical ethics? Journal of Medical Ethics 2010;36:656–60. 11. Haimes, E.What can the social sciences contribute to the study of ethics? Theoretical, empirical and substantive considerations. Bioethics 2002;16:89–113. 12. It is important to note that this (analytic philosophical) account of the convincingness of arguments is open to dispute. 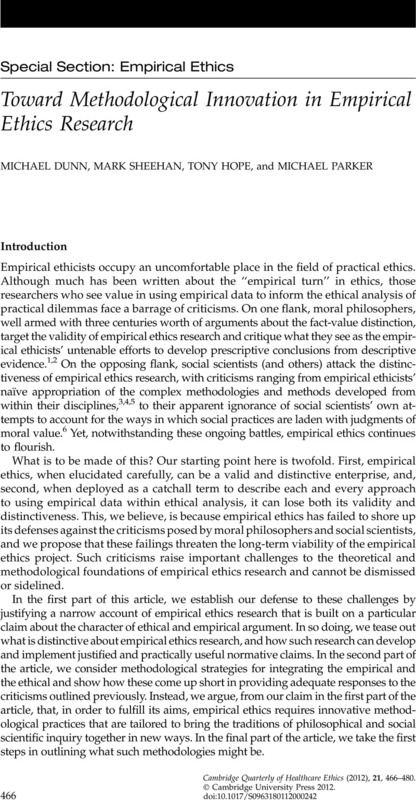 This is of particular importance here because many of the most well-established ways of justifying the theoretical and methodological foundations of empirical ethics research begin by taking issue with such an account. We reflect briefly on the relationship between our analysis of the value of empirical ethics and the approaches emanating from alternative philosophical traditions in ethics in the conclusions of the article. 13. Sheehan, M. Moral relativism. In: Ashcroft, RE, Dawson, A, Draper, H, McMillan, J, eds. Principles of Healthcare Ethics. 2nd ed. Chichester, West Sussex: Wiley; 2007:93–8. 14. Wiggins, D.Moral cognitivism, moral relativism and motivating moral beliefs. Proceedings of the Aristotelian Society 1990;91:61–85. 15. See note 2, Garrard, Wilkinson 2005. 16. Rawls, J.A Theory of Justice. 2nd ed.Cambridge, MA: Harvard University Press; 1999. 17. Scanlon, TM. Rawls on justification. In: Freeman, S, ed. The Cambridge Companion to Rawls. Cambridge: Cambridge University Press; 2002:139–67. 18. van Delden, JJM, van Thiel, GJM. Reflective equilibrium as a normative-empirical model in bioethics. In: van den Burg, W, van Willigenburg, T, eds. Reflective Equilibrium: Essays in Honour of Robert Heeger. Dordecht: Kluwer; 1998:251–9. 19. van der Burg, W, van Willigenburg, T, eds. Reflective Equilibrium: Essays in Honour of Robert Heeger. Dordecht: Kluwer; 1998. 20. McMillan, J, Hope, T. The possibility of empirical psychiatric ethics. In: Widdershoven, G, McMillan, J, Hope, T, van der Scheer, L, eds. Empirical Ethics in Psychiatry. Oxford: Oxford University Press; 2008:9–22. 21. Dunn, M, Ives, J.Methodology, epistemology and empirical bioethics research: A constructive/ist commentary. American Journal of Bioethics 2009;9:93–5. 22. Molewijk, B, Stiggelbout, AM, Otten, W, Dupuis, HM, Kievit, J.Empirical data and moral theory: A plea for integrated empirical ethics. Medicine, Health Care and Philosophy 2004;7:55–69. 23. Widdershoven, GAM.How to combine hermeneutics and wide reflective equilibrium? Medicine, Health Care and Philosophy 2007;10:49–52. 24. Carter, SM.Beware dichotomies and grand abstractions: Attending to particularity and practice in empirical bioethics. American Journal of Bioethics 2009;9:76–7. 25. See note 21, Dunn, Ives 2009, at 94. 26. Ives, J, Draper, H.Appropriate methodologies for empirical bioethics: It’s all relative. Bioethics 2009;23:249–58. 27. Parker, M.Ethnography/ethics. Social Science and Medicine 2007;65:2248–59. 28. Dunn, M, Clare, ICH, Holland, AJ.Substitute decision-making for adults with intellectual disabilities living in residential care: Learning through experience. Health Care Analysis 2008;16:52–64. 29. Ives, J, Dunn, M.Who’s arguing? A call for reflexivity in bioethics. Bioethics 2010;24:256–65. 30. Widdershoven, G, van der Scheer, L. Theory and methodology of empirical ethics: A pragmatic hermeneutic perspective. In: Widdershoven, G, McMillan, J, Hope, T, van der Scheer, L. Empirical Ethics in Psychiatry. Oxford: Oxford University Press; 2008:23–36. 31. Lindemann, H, Verkerk, M, Urban Walker, M.Naturalized Bioethics: Toward Responsible Knowing and Practice. Cambridge: Cambridge University Press; 2009. 32. See note 22, Molewijk et al. 2004. 33. Widdershoven, G, Abma, T, Molewijk, B.Empirical ethics as dialogical practice. Bioethics 2009;23:236–48. 34. Widdershoven, G, Molewijk, B, Abma, T.Improving care and ethics: A plea for interactive empirical ethics. American Journal of Bioethics 2009;9:99–101. 35. Frith L. Symbiotic empirical ethics: A practical methodology. Bioethics 2012;26:198–206. 36. Molewijk, AC, Abma, T, Stolper, M, Widdershoven, G.Teaching ethics in the clinic: The theory and practice of moral case deliberation. Journal of Medical Ethics 2008;34:120–4. 37. See note 33, Widdershoven, Abma, Molewijk 2009.